Model T Ford Forum: Bolts? 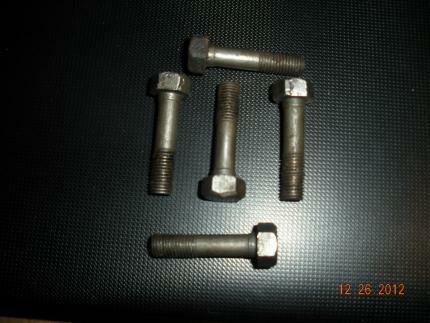 Model T Ford Forum: Forum 2012: Bolts? Differential? If so you are missing two and the nuts. I am wondering if they the blind bolts that go into the hogshead near the starter, or the front timing cover bolts that require no nuts? Andy,all those bolts are 3/8 NF thread. Agree with Jack, that size is correct for the rear pumpkin (axle case) bolts, Part # 2503E. If they are 5/16,that is the only place I can think of . My first thought was timing cover bolts. Where did you find that diagram? Sure would like to have a print of it in my shop. Other than the 7 bolts and plain nuts around the diff centre, the only other place I can recall 5/16" bolts being used is the four which hold the handbrake cross shaft to the chassis, and these are drilled for split pins and have castle nuts. Thats a great bolt diagram. I wonder why a neat restoration tool like that isnt avaliable from the suppliers? It would make real sense to have one for the restorer! I have to ask the question, is it a Ford product? I thought I had seen most of the ones by Ford over the years. Whoever its from its a very useful diagram. wow..great diagram. What do the number next tot he bolt/nut size mean? For example: Take the upper left most as an example - the rear spring hanger nut. What is to the left of the 11/16th in that illustration. The first looks like an open ended wrench. When looking closely at the diagram I just noticed that the number of wrench to use is next to the size bolt. That must be a shop print to use at a Ford dealership. Maybe? Question: are the wrench numbers the same used by Ford for their tools? Maybe some of you tool guys can answer this one. John, I am on vacation, but when I get back to the office, I will try and send it to you then. Happy New Year from Daytona Beach! I had so many requests, I retrieved the file and sent it. Hope you got it.